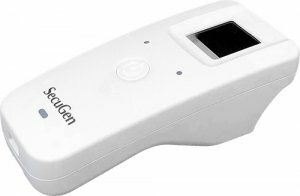 The Secugen Unity 20 Bluetooth (HU20-ASF-BT) fingerprint reader is the world’s first elegantly designed, low cost, fully programmable Bluetooth fingerprint reader. Featuring a sleek wireless design with a premium FBI certified fingerprint sensor, the Unity 20 Bluetooth can securely transfer fingerprint data wirelessly to mobile devices for convenient biometric authentication, identification and enrolment. 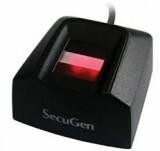 The Secugen Unity 20 Bluetooth fingerprint reader (Manufacturers Part No. 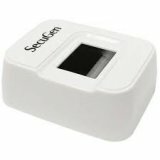 HU20-ASF-BT) can be used together with a mobile device (such as smartphone or tablet) to scan, enroll, and authenticate users without the need for cables or OTG adapters. The reader is built with the industry’s most rugged and patented optical fingerprint technology and yet is small enough to be carried in a pocket and held comfortably in one hand. It can also be used on the desktop with Bluetooth-enabled PCs. Thoughtfully designed, the device works in either direction so you scan your finger or another person’s finger without having to turn the device around. Developers can use Unity 20 Bluetooth also right out of the box by calling the built-in Fingerprint Management System (FMS) software’s simple API. Alternatively, the device can be custom programmed using its Linux development environment, its included MINEX-compliant fingerprint algorithms, OpenSSL cryptography libraries and 1 GHz CPU. The device can also store encrypted fingerprint templates and process them in a closed environment without their ever leaving the device for enhanced security.